The longest partial federal government shutdown in American history may be over, but the economic consequences for people across the country endure. Decades of conservative rhetoric about smaller government were tested in real time, with disastrous costs for individuals, families, and businesses. On Tuesday night, President Donald Trump will deliver a State of the Union address that is sure to pass the blame for his shutdown onto others while he takes credit for an economy that has been growing for nine years. In his two years in office, President Trump has done everything in his power to set American workers and families back and place the country on the road to a low-wage, high-cost economy in which a few hands hold all the economic power. The 35-day shutdown is just the latest in a series of actions that hurt everyone except the wealthy and those with political connections. The shutdown is the latest example of the Trump administration’s disregard for American workers and families. The Congressional Budget Office calculated that the five-week shutdown cost the U.S. economy $11 billion, $3 billion of which will never be recouped. But for millions of Americans, the shutdown’s effect on their paychecks was more apparent. About 800,000 federal workers were furloughed or worked without pay, and as many as 1.2 million contractors felt the impact—and may not receive back pay. In addition, shutdowns have a disproportionate effect on black workers and families. In fact, the proportion of federal workers who are black women is twice as high in the federal government as it is in the greater civilian workforce. At the beginning of the shutdown, about half of all federal workers were still required to show up to work without pay; yet that number grew as the Trump administration played favorites with agencies in response to lobbying from some industries. Beyond the shutdown’s effects on the nearly 2 million workers employed by the federal government or working as contractors, there are economic consequences that result from closing various parts of the government that help Americans in their everyday lives. For example, elderly renters in rural areas rely on the Department of Agriculture for rental assistance while homeless veterans rely on the Department of Housing and Urban Development for similar assistance. Moreover, as a result of the shutdown, community organizations that help families afford food or stay safe while fleeing domestic violence dealt with funding uncertainty and had to limit support or tap into emergency funds. Meanwhile, small-business owners who had planned to expand into new areas or hire new staff were unable to receive loans from the Small Business Administration. And delays in reports and forecasting about agricultural crops and fisheries have constrained farmers’ ability to prepare for the spring season. Larger businesses even suffered consequences: The Securities and Exchange Commission (SEC) delayed initial public offerings (IPOs), limiting businesses’ ability to raise capital as planned. Government funding will expire again next week, and it is imperative that the president does not shut the government down this time. In his State of the Union address, President Trump will tout carefully chosen data about the economy in order to make a case for his policies. Yet the statistics that the president uses to brag about the economy do not capture the full picture. Moreover, they hide where—and which—Americans continue to struggle. The overall unemployment rate has continued to go down this year, as it has since long before the Trump administration. But low unemployment has not translated into commensurate gains in wages or sufficient improvement in labor force participation. Typically, the low unemployment rates on which the president focuses would indicate that workers are in demand, which in turn raises salaries or leads to better jobs. Instead, wages have barely budged. The minimum wage has lost significant purchasing power in the decade since it was increased. Overall, real wages for workers without four-year college degrees have been essentially stagnant for decades. Similarly, the overall participation of 25- to 54-year-old workers in the labor market is down from its 1999 peak level, an indicator of slack in the labor market. More and more Americans aren’t participating fully in the economy—meaning they have stopped looking for jobs or are unable to find full-time work when they look for it. As the Center for American Progress’ Blueprint for the 21st Century highlights, this reflects an economy that is not creating jobs that American workers need—especially jobs for non-college-educated Americans. Indeed, if the labor force participation rate for 25- to 54-year-olds were at its 1999 peak, the unemployment rate for this demographic would increase from 3.3 percent to 5.6 percent. Furthermore, the employment numbers show that the employment and wage gaps that exist across America have not closed; these gaps persist between urban areas and rural communities, between white and black Americans, between white and Latinx Americans, and between women and men—as well as at the intersections of these groups. At the end of 2018, the unemployment rate for Latinx workers was 1.4 times that of white workers, and the unemployment rate for black workers was nearly double that of white workers. 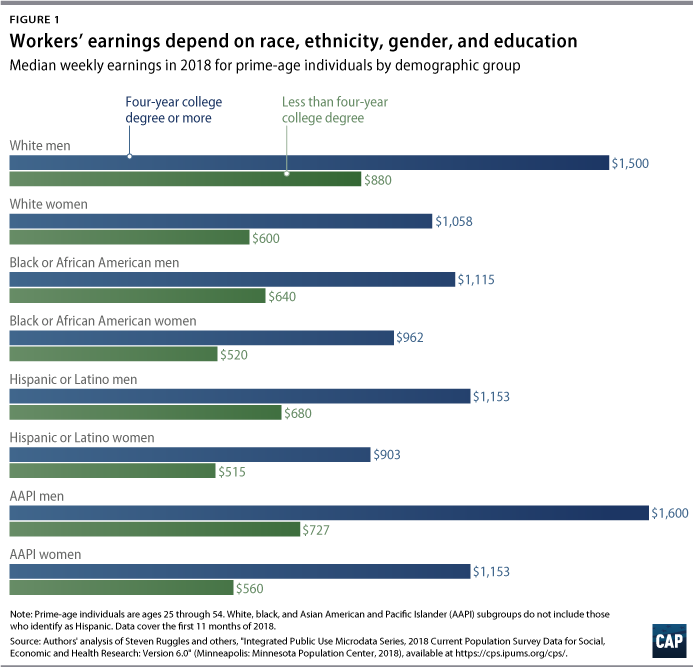 Earnings are also constrained by a person’s demographics: Women, black and Latino men, and white men without four-year college degrees earn significantly less each week than white men overall. Meanwhile, people with disabilities and members of the LGBTQ community face discrimination and barriers to participation in the labor market. Regional differences also remain pronounced, in some cases, reflecting years of systemic inequality—including anti-worker policies—while, in others, reflecting government failures to invest in workers and communities. Trump’s economy continues to squeeze Americans who are struggling to make ends meet. As the costs of rent, child care, health care, and postsecondary education continue to rise faster than wages, declining earnings and persistent wage and wealth gaps illustrate that, for many Americans, the ability to save for retirement or send children to college is out of reach. Since 2000, rent of primary residences has increased, on average, by 15 percent in real terms, while the median income of renter households has decreased by 2 percent. This trend makes it increasingly difficult for renters to afford other basic necessities and makes saving and building wealth nearly impossible. As the American middle class continues to decline as a share of total U.S. income, working families seeking to join or stay in the middle class face greater challenges than ever. In the State of the Union, the president will likely brag about the stock market, claiming that it shows the strength of the economy. But for millions of Americans, the 2008 financial crisis and failure to fully recover from the Great Recession were major hits to wealth reserves. As families try to rebuild their wealth—the strongest indicator of their ability to weather a health crisis or period of unemployment—they are thwarted by stagnant working- and middle-class wage growth. Moreover, due to long-term structural inequality and discrimination, the wealth gap between black and white families persists regardless of education, marital status, age, or income. Today, 4 in 10 adults would not be able to afford a $400 emergency expense. Without targeted policies that address income as a means of building wealth, American families—particularly nonwhite families—will remain economically insecure. Stagnant wages, low-quality jobs, and rising costs have created an economy in which 51 million American households struggle to afford basic necessities. Yet the Trump administration has launched repeated attacks on programs that help families put food on the table and send their kids to the doctor. It has pushed punitive so-called work requirement policies, which take food, health care, and housing away from workers who cannot find a job or get enough hours at work each month. Last December, on the day that Congress rejected a version of the Farm Bill that would have dismantled food assistance with work requirements, the Trump administration announced plans to sidestep Congress and impose these cuts unilaterally. Similarly, the administration has encouraged states to take away health care from unemployed and underemployed workers by imposing Medicaid restrictions, compounding the damage from its efforts to sabotage health care markets. The administration has also proposed such cuts for housing assistance, despite a spiraling homelessness crisis driven by a lack of affordable housing. These moves aren’t just cruel; evidence shows that stripping basic necessities away from workers won’t help them find a job any faster—and may actually be counterproductive. Moreover, there is no indication that the president will use his major annual address to roll out any major reversals to his harmful policies. Against this backdrop, concentration of economic power only gets worse. The Tax Cuts and Jobs Act (TCJA) of 2017 showcased the president’s true priorities: corporations, not American families. Despite the trends outlined above, the Trump administration made it a top priority to enact a tax cut heavily weighted toward large corporations and the wealthy, which the administration jammed through Congress at the end of 2017 despite strong public opposition. In his address, President Trump will likely repeat the claim that the tax cuts will soon trickle down to American workers in the form of a $4,000 wage increase for the typical family. But that promise has proven to be false. 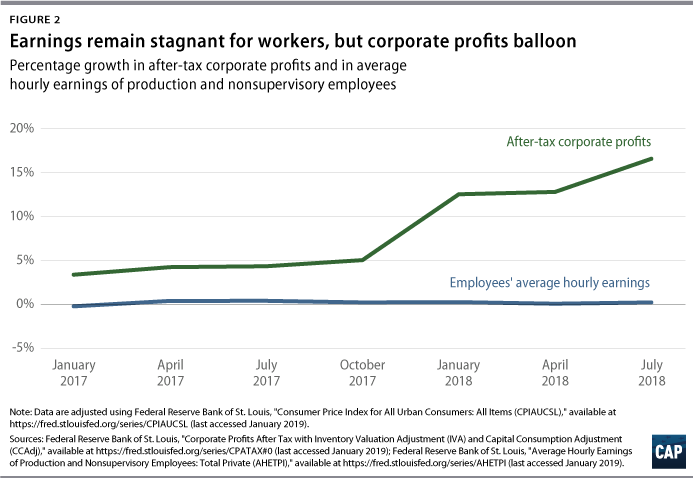 Instead, corporate profits have skyrocketed, while the gulf between these profits and wages continues to widen. Trump administration officials have claimed that the tax cuts would spur a boom in new business investment. However, no such boom has materialized. Business investment grew in the first two quarters of 2018 but slowed dramatically in the third quarter. Instead of investing in real estate, purchasing machinery or tools from local businesses, increasing wages, or making other economic decisions that contribute to the growth of communities, businesses have simply put more money toward stock buybacks. Corporations have largely chosen to use their tax windfall to enrich shareholders and executives and to drive mergers and acquisitions across the economy. Despite campaign promises to look out for workers, the Trump administration has furthered this concentration of economic power by largely greenlighting another wave of corporate consolidation. In sector after sector, America faces the growing threat of closed markets controlled by a small handful of dominant firms, which is stifling entrepreneurship, innovation, and consumer choice, while also imperiling democracy. Concentrated economic power is further bolstered by a wave of deregulation being driven economywide. From workplace safety protections to the environment, corporate power increases, while working families’ priorities are crushed. Furthermore, the administration and Trump-appointed financial regulators are rolling back the important financial stability safeguards and consumer protections put in place to keep American workers from facing another financial crisis. The fact that the shutdown further hamstrung the SEC’s ability to hold companies and financial market participants accountable is only the latest example of the administration’s clear preferences: It answers to Wall Street, not working families. Trump’s low-wage, high-cost, power-concentrated economy is not the only choice America has. The vision of government and America that the president will provide in Tuesday’s address won’t present a suite of policies that could raise wages, lower costs, build wealth, or break up concentrated economic power to restore accountable government. Congress should pass a bold infrastructure package to create jobs and raise wages and to tackle the climate crisis. As CAP’s Jobs Blueprint lays out, government can improve lives and provide well-paid, dependable jobs by investing in child care, school construction, climate-focused retrofits, and long-term care, as well as by providing a partial job guarantee for communities facing the most severe challenges. Pairing these jobs with paid training; a $15 minimum wage; comprehensive and equitable paid family and medical leave; and tools to increase worker voice and power can meaningfully improve economic opportunities for workers and families across America. The State of the Union will not introduce policies to increase wages; nor will it announce any intentions to rein in costs. Government, however, can address the cost burden facing working families by investing in bold new approaches to build affordable housing, taking further steps to ensure that all Americans have affordable health care, fighting for workers’ retirement savings, and standing with savers and retirees—rather than with Wall Street. 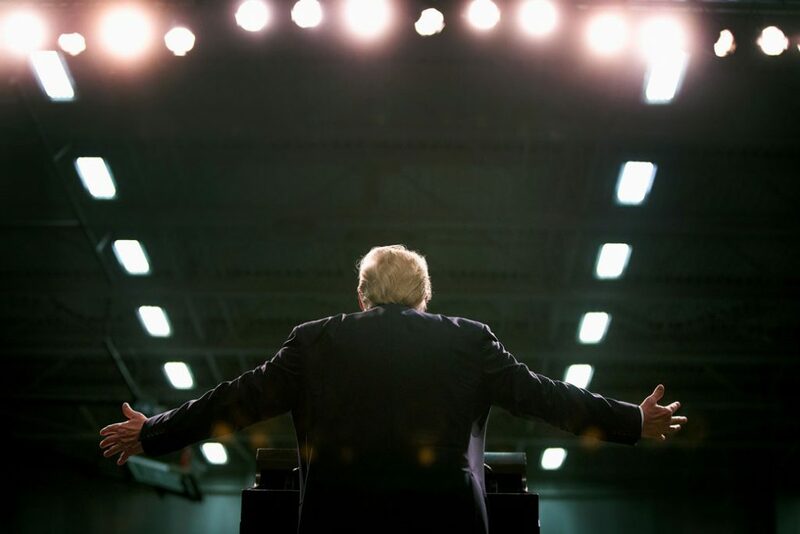 Economic power and political power reinforce and strengthen each other, and Trump’s vision of the economy concentrates these powers in the hands of the few. Government can and must stand for a democracy where economic and political power are broadly distributed. That means implementing key democracy reforms; reviving antitrust enforcement for industries from agriculture to technology; and ensuring that financial markets are oriented toward the long-term public interest. The state of the economy will only be strong when government is equipped and empowered to stand up for all Americans. Lily Roberts is the director of Economic Mobility at the Center for American Progress. Andy Green is the managing director of Economic Policy at the Center.